GOLDEN,Colo. -- After witnessing the initial surge of public interest in suborbitalspace tourism that followed the successful flight of the X Prize-winningSpaceShipOne three years ago, officials at Virgin Galactic thought the pace ofpaid reservations might slow down in 2007 ? particularly since SpaceShipTwo isnot slated to launch before late 2009 at the earliest. ?In thelast quarter, we have doubled the number of bookings taken on the same time lastyear,? said Carolyn Wincer, head of Astronaut Sales for Virgin Galactic. Wincertold SPACE.com the company had thought that interest might drop for awhile until the new spaceship was rolled out. ?However,this is not the case at all,? she said. ?As word gets around that you can makea reservation now, people are keen to secure a place. Even better, uptakeis in line with our ?best case scenario? from our original business plan ?meaning that the price point and estimates of interest that we projectedourselves, and based on market research, are so far proving to be correct.? So in thebig picture, Wincer says the strong public interest is ?good news for all spaceenthusiasts and for the industry as a whole!? Initially,Virgin Galactic space flights will operate from the Mojave Spaceport in Mojave,California ? home of Burt Rutan?s Scaled Composites, the company that builtSpaceShipOne and where SpaceShipTwo is now coming together. TheSpaceship Company, a joint venture announced in July 2005 between Sir RichardBranson?s Virgin Group and Burt Rutan?s Scaled Composites, has contractedScaled Composites to design and build SpaceShipTwo and the carrier mothershipWhiteKnight Two. SpaceShipTwois being designed to accommodate sixpassengers. It is scheduled to be unveiled before the end of 2007 and willbe named Virgin SpaceShip (VSS) Enterprise. VirginGalactic will own and operate at least five of the newspaceships and two motherships. The spaceline operator has established aset payment of $200,000 per seat, with a minimum refundable deposit of $20,000to make a reservation. Wincer said200 customers from 30 different countries have already made deposits to confirmtheir reservations. Freshstatistics from Wincer show some interesting trends. The countrythat is home to the largest number of ticket buyers is the United States,followed by the United Kingdom, Japan, Russia, Australia, Canada, New Zealand,Spain, and Ireland. In terms of the proportion of Virgin Galactic customers percapita, the top three countries are New Zealand, Ireland and Denmark. Of thecustomers who have signed up so far, 15 percent are female, Wincer?s statisticsshow. Ten percent of total customers booked through a travel agent, but 30percent of the bookings have been received via Virgin Galactic ?AccreditedSpace Agents? ? an initiative launched in January of this year, she said.Accredited Space Agents are registered travel agents who have been speciallyselected and fully trained on all aspects of the Virgin Galactic offering. Australia has nine travel agencies and about 30 travel consultants. New Zealand has one national chain with 10 consultants. Japan has one agency with five consultants. The United States has 47 consultants from about 45 agencies, all of these are members of Virtuoso, a leading leisure travel network. Canada has six consultants from four agencies (who will be trained next week in Vancouver and are all Virtuoso members). The United Arab Emirates (UAE) has one agency with about 12 consultants. Then add one agency and two to three consultants from each of the following who are all being trained this week at the International Space University: Austria, Germany, France, Spain, Portugal, Italy, Greece, the United Kingdom, Russia, Israel, and the Czech Republic. ?I mentionthe number of consultants as they are the ones who actually become ?ASAs? afterthey undergo our one day training program covering technology, customerexperience, g-forces, medical issues, sales, marketing and public relations,?Wincer said. ?By doing a quick tally, by the time we finish the trainingin Vancouver, we should have around 100 ASA consultants worldwide from around82 agencies in 17 countries.? What youget for your $200,000 includes three days ofpre-flight preparation, bonding and training onsite at the spaceport. The big dayarrives with departure of the White Knight Two that cradles SpaceShipTwo,hauling the vehicle and passengers to 50,000 feet (15,240 meters) inaltitude for release. Space travelers will then be rocketed to around 360,000 feet (109,728 meters) in altitude, some 68 miles (109 kilometers) high, with ?fee-floating? passengers experiencing 4 to 5 minutes of microgravity. Faces pressed against large windows, customers get an on-high view of more than 1,000 miles (1,609 kilometers) in any direction. As for the length of time for SpaceShipTwo to glide to a terra firma touchdown, that takes some 30 minutes. The suborbital journey ends with SpaceShipTwo gliding to a runway landing. All-in-all,the suborbital sojourn ? from takeoff to touchdown ? takes approximately 2.5hours. In theUnited States, those who travel above an altitude of 50 miles (80 kilometers)are designated as astronauts. TheF?d?ration A?ronautique Internationale (FAI), the world air sports federationbased in Lausanne, Switzerland, defines spaceflight as over 62 miles (100kilometers). 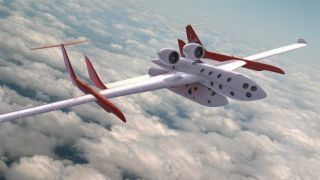 Virgin Galactic passengers will receive Virgin Galactic astronautwings and may receive Federal Aviation Administration astronaut wings as well. Whileinitial spaceline operations will take place at the Mojave Spaceport, VirginGalactic is to establish its headquarters and operate space flights from SpaceportAmerica, now under construction in New Mexico and billed as the world?sfirst ?purpose built? commercial spaceport. Momentum ispicking up in readying Spaceport America for operations ? but first the paperwork. The NewMexico Spaceport Authority anticipates official filing of its licenseapplication later this year to the Federal Aviation Administration. ?We expectto receive the Record of Decision on the Environmental Impact Statement and theapproval of the license application in early 2008, and we plan to break groundshortly after that,? said Rick Homans, Executive Director of the New MexicoSpaceport Authority. ?Bottomline?we remain on schedule to be operational by late 2009 or early 2010,?Homans told SPACE.com.